Countdown is a list of news items, videos, or just ruminations that involve imbibing or are just more entertaining with an adult beverage. After all, life is life, but talking about it with a drink makes it more interesting. Feel free to sound off on any of the topics in the comment section. 5) Get busy, It's Your Earth Day! Yesterday was El Dia de la Tierra folks, which means it's either time to recycle for one day or contend that global warming is a hoax. I'd rather sit back and watch the debate with a cold beer (it's hotter than ever outside!). But what is that beer's footprint? According to an article in The Daily Campus not listing its source (but if it comes from The Daily Campus, you know it has to be true), "the amount of water required to brew one keg of beer can be as much as 232 gallons." Now I don't have a calculator, but if 15.5 gallons are in a keg, then that is like 14.967742 times the amount of water in the final product! Shocked yet? Relax... breathe... and drink up... Wine is worse, but even wine is not as big of a water hog as beef, apples, or soybeans. If you are asking, "SirRon, I'm a yuppie Smart Car driving suburbanite. What should I drink?" I suggest having a Fat Tire. The employee owned New Belgium Brewery in Fort Collins, CO has been wind powered since 1999. The brewery also collects its wastewater instead of sending it down the drain and off to the local wastewater plant. Instead, they add an anaerobic digester to the wastewater, which breaks down the organic matter and gives off methane. That methane is then captured and used to fuel an engine that creates electricity for the brewery. But wait, there is more! The waste heat from turning methane to electricity is then captured to make hot water that is used as heating in brewery. How about *that* for being miles from ordinary? That's cogeneration folks. Take that Corona! I can brag on New Belgium because I got a chance to visit on a detour from GABF. As innovative as they are, NB has nothing on craft beer pioneer Sierra Nevada's green efforts... but enough nerd talk. Just kidding on the nerd talk. Want a reminder that there are people working on things much cooler than your work? The folks at the Rensselaer Polytechnic Institute in New York are developing nanotubes that are flexible and thin enough to be placed under the skin. The "nano skins" are low power and can receive data wirelessly (can you say endless tattoo possibilities?). Somewhere there is a girl who got a drunk tat of "Klye" on her lower back who now realizes her children will not have to go through the same embarrassment as their mother. After you are done reading everything on at theferm.org, swing on over to the Philips website to see a super creepy video of electronic tattoo possibilities. Hey, I said *after* you finished reading everything! Your drinking habits are going to probably cost you a little extra in the future. Several states are simultaneously jumping on the bandwagon and raising taxes on alcoholic beverages. New York is raising taxes fairly modestly, amounting to just pennies more per bottle of wine or six pack of beer. However, this "floor tax" will be applied to the stocks of wholesalers and retailer. Expect your liquor store to start carrying a lot less in the future... and New Joisey liquor stores to start getting more business. Nice one yanks. Oregon is also looking to raise beer their taxes. Recent legislation will tax beer sold in Oregon from effectively less than a penny a glass to $0.15 (hey, that better be a fair pint pour!). The state expects $165M per year to be collected from the 1,900% tax hike. Why do 61% of Oregonians favor the tax? Because the tax will allow the funding of alcohol, drug crisis, and suicide prevention programs... how can you say no to that? I have no official comment, if you know what I'm sayin'. "It's about time the national and international companies that sell their beer in Oregon need to pay their fair share of the $3 billion a year for alcohol-related crime, violence, lost productivity and health costs," says Pete Schulberg. Communications Director of Oregon Partnership. "Guess who's been paying for it up to now? Oregon Taxpayers, that's who." $3 billion dollars!? Is it too much to ask for a list of data and/or assumptions for that calculation? Since, according to the OP, 90% of the tax will be coming from breweries outside Oregon, I guess the B-M-C evil empire will be the ones saving the lives of troubled Oregonians (since they control most of the beer market anyway). I suppose I can live with that. 2) Do These Beer Goggles Make My Face Look Fat? In "I'm glad my tax dollars didn't pay for that" news, a recent UK study discredits the beer goggle defense... at least when it comes to underage and "mature" faces (I saying guess "old" is passé). Thank you Professor Vince Egan of the University of Leicester for your dedicated research. "We found that while alcohol consumption significantly inflated attractiveness ratings for participants looking at sexually mature faces with high levels of make-up, greater alcohol consumption itself did not lead to overestimation of age," said professor Egan. "Consumed alcohol had no effect on men estimating the age of either mature or immature faces." I thought the beer goggle hypothesis had already become a theory or a law based on a thorough study in 2003 by some other bleeding edge researcher. I'm happily married so I'll just roll with whatever the expert-o-the-day is saying. My problem has always been how attractive those shots look after 6 pints. Maureen Ogle, please read this! Having trouble understanding the fundamental differences in artisanal cheese maker and Velveeta? Certainly Velveeta could make artisanal cheeses, but why don't they? 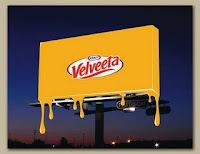 Conversely, doesn't Jane Cheesemaker want to be Velveeta? I had to listen to you and Ben Stein derail a near dream team beer panel during Beer Wars, so you should have to commit a few minutes to The Ferm's thoughts. The intra-industry Little Guy/Big Guy dynamic can be seen in a recent NYT piece. Eric Asimov recently posted a great profile of Randall Grahm, owner of Bonny Doon Vineyards. Mr. Grahm started small in 1983, but quickly grew his business by making mass market wines. Being a true winemaker who appreciates the craft of both growing grapes and crafting wines, he recently took a sharp detour on the road to become "The Man." Rather than follow the dollar at the expense of the product, he chose to sell significant parts of his company and scale back. "Instead of being a great marketer," he wants to make wines that are distinctive and unusual. Bravo! Sorry to pile on Beer Wars again, but this point was misrepresented in the portrayals of Sam Calagione and Greg Koch in the movie and live panel. These guys are brewers first... marketers second. Ugh, don't get me started. While I rant (off keyboard), be sure to read NYT's curiously wine-centric "drinking blog" for the great profile piece on Randall Grahm. It's a good read on an important figure, but unknown face to most of the public, in the wine making industry.